The summer of 2005 finds us Southerners getting an early start on hurricane season, and my most sincere compassion lies with the people directly affected by Hurricane Dennis, both in America and in Cuba. It's only July, but we're already on our fourth named storm and it's a major hurricane. Enough, already. For those of you west of Galveston and/or above the Mason-Dixon Line (the official boundaries of Mother Nature's Bowling Alley), you need to understand that any time a named storm enters the Gulf of Mexico, it's like having a rattlesnake running loose in your living room. It is almost impossible to think about anything else. The appearance of the first major storm also reminds every Southerner to review their Hunkering Down skills. 1. Evacuation: for those unfortunate enough to be in the direct path of a hurricane ranking Category 3 or higher, this means cramming flashlights, prescriptions, radios, blankets, rainwear, pets, pet food, road maps, family photos, bank account and insurance information, toilet paper, and a week's worth of clothes, diapers, food water, soda and chips into the family vehicles and sitting in gridlocked traffic on the Interstate for 19 hours at a stretch in hopes of finding a hotel, a cousin, or an old college roommate somewhere east of Denver so you have a place to stay while your house is washed into the Gulf of Mexico. 2. Hunkering Down: for those of us anywhere within three states of the expected landfall site, this means stocking your house with all of the abovementioned items, filling your gas tanks, and stripping the grocery store shelves of bleach, duct tape, batteries, candles, beer, chips, propane and clean-up supplies. You also are required to fill the garage with patio furniture, bicycles, garbage cans, barbeque grills, potted ficus trees, trampolines, Volkswagens, Mini-Coopers, and anything else that could become airborne. a: complete fools with beachfront property in the path of a real hurricane -- a Category 3, 4 or 5 storm -- who somehow believe that they can ward off the Wind Demon simply by staying home and "riding it out." These people invariably are either heavily-armed native Southerners with two first names who have stopped taking their medications, or badly misguided people from Wisconsin who are spending their very first summer in a beachfront retirement condo. b: Native Southerners in the direct strike path of a baby hurricane -- a Category 1 or 2 storm -- in which case a voting majority of the household will argue most convincingly that it is far, far better to stay home and be terrified, than to crawl along the Interstate looking for a hotel, a cousin, or an old college roommate. If you decide to engage in Advanced Hunkering Down, in addition to the normal Hunkering Down activities, you also have to nail plywood over your windows, put your furniture up on cinderblocks, kiss your boat goodbye, and sandbag your house. You will also need an up-to-date will locked in a safe deposit box in Montana, funeral insurance, and a generous supply of Scotch and Valium. If you live anywhere inland, as my husband and I do, most of hurricane season involves normal Hunkering Down. Inlanders, while Hunkering Down, can expect to be invaded by Evacuating relatives from Florida, Houston or New Orleans. Once you have come home from the grocery and secured everything that might take wing, you can settle down into the major activities of Hunkering Down, namely, parking yourself in front of the Weather Channel, eating microwave popcorn... and knitting. Knitting is an exceedingly good Hunkering Down activity. You can knit while you watch the soggy weather reporters on the beach at Pensacola leaning into the wind and screaming into the microphone so you can see with your own two eyes that there really is an honest-to-God hurricane out there, and not just an enormous red blob on your TV weather map. You can knit while you anxiously await the next update on the storm's precise position and wind speed. Non-Southerners cannot begin to comprehend how critical it is to know the exact hourly coordinates of a hurricane. Yes, we know, we can't do anything about it. We are as helpless as a blade of grass in the path of John Deere. Nonetheless, hourly hurricane positioning is an obsessive-compulsive Southern thing. We just need to know, so we can decide whether to Evacuate, buy more beer, or proceed to Advanced Hunkering Down. You can knit while you engage in highly animated debates about whether this hurricane will be as bad as Hurricane Camille, which was the Mother of All Hurricanes. If you are not old enough to remember Camille, consider yourself lucky, and just try to imagine Hurricane Andrew -- squared. If you also can't recall Hurricane Andrew, just nod when us older folks get worried, and hope you never, ever see a Category 5 storm, okay? You can even knit if the power goes out while Hunkering Down, which is an outstanding but sneaky opportunity to teach someone else to knit after you pry the useless TV clicker out of their hands. Hunkering Down is also the best time to pull out a UFO and get down to it, already. Maybe it's the sense of impending doom, but I always end up working on UFOs during hurricane season. Something in my subconscious, perhaps, whispering into my ear: if this storm klls me, the ghost of that forgotten sweater will follow me into the next life unless I finish it before the storm hits. So in between hurricane updates I've pulled out my two oldest UFOs -- a suit in perle cotton which I started several years ago and only seem to work on during hurricane season, and the Other Sock of a pair of black-and-gold wool knee socks which are of about the same vintage. 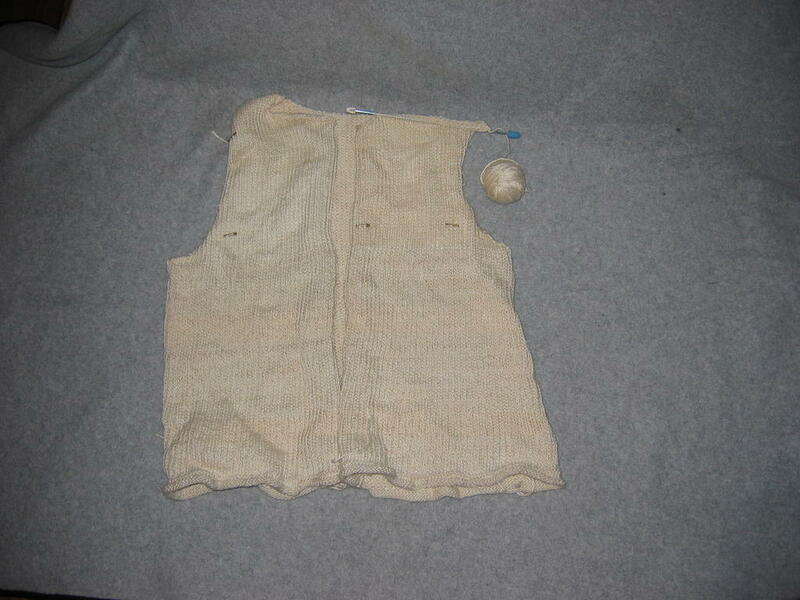 This is not a vest. This is the torso portion of a Chanel-type suit jacket adapted from a 1960's Pat Trexler pattern. It is done in a vintage, crepe-like perle cotton in a medium shade of cream. Here it lies, grumpy and embarrassed because I have rudely awakened it from hibernation and photographed it all rumpled and tousled, right out of bed. The whole thing is done entirely in heel stitch on #3 needles, so it has a wonderful drape, but it's as heavy as a diving belt and thus I lose interest in it once we are out of immediate danger of being in the direct path of any given hurricane, at which point I put down the suit jacket and pick up the Other Sock while I watch to see what's happening to the folks down in Florida. 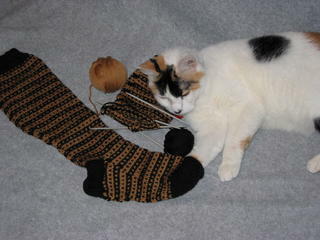 The Other Sock, and its mate, are being inspected by Tessie. 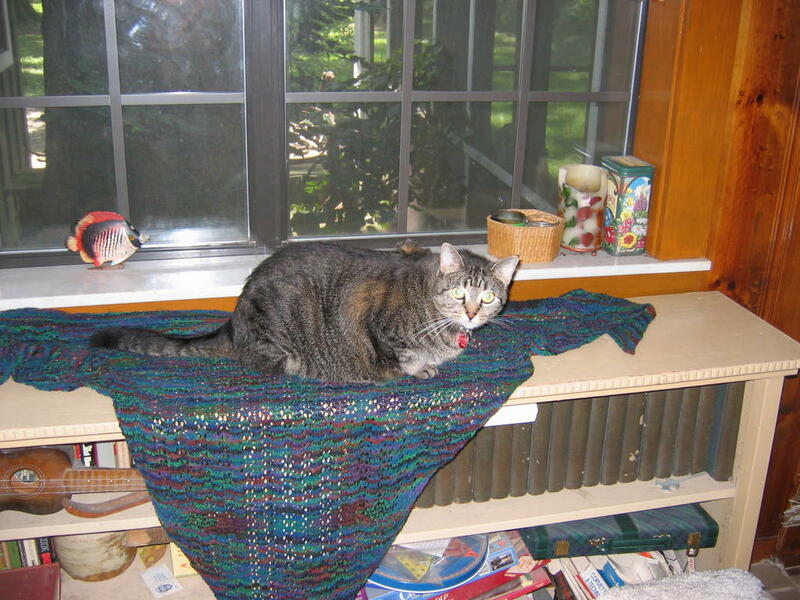 Tessie, at 18, is a retired Fiber Content Analyst, who is especially fond of the soft merino wool that these socks are made of. She is also very particular about finishing techniques, and is examining the toe of the Finished Sock to assure that the Kitchener Stitch join is secure and even. I feel confident that the Other Sock of this wooly pair will be finished this hurricane season and ready for use this winter. For those of you who remain convinced that Southerners don't need wool, consider this: while our winters are not long and severe, they are rainy, sleety and chilly. And, in addition to keeping you warm even when wet, wool has another virtue which makes it highly valuable in the South. Very enjoyable! You've got us pegged, you old swamp rat! What WERE you thinking - a suit in perle cotton? If the storm seasons keep going at this rate, you'll WEAR the fool thing, I bet.